For the first time in a while Apple sold significantly less iPhones than analysts expected - 26 million on projections for 28 million or more, and this might have opened the door for Samsung. The Korean company is estimated to have sold around 52 million smartphones, nearly twice as many as Apple, and that’s hugely impressive. Just around a year ago, Samsung was playing catch up to Nokia, and now it’s clearly the world’s biggest smartphone maker, and it might be outselling Nokia by nearly 5 times, according to Juniper Research estimates. Former smartphone leaders Nokia shipped 10.2 million smartphones in Q2, and RIM delivered 7.2 million. So far we only know for sure that Samsung shipped 10 million of its high-end Samsung Galaxy S III, and the Galaxy Note is continuing to sell well and is gearing up for launch on T-Mobile. But it’s not just about the cutting edge devices - Samsung covers everything from the ultra low end in smartphones with devices like the Samsung Galaxy Pocket and Y, to the heights with the Note and S III. “Galaxy products hitting all price points leveraged its global brand strength and the popularity of the Android OS to drive sales of smartphones in all price tiers,” Juniper summed up. Interestingly, the research firm suggests Sony should be one company doing better in these times as it has the global recognition and design. What do you think, could Samsung really sell twice as many smartphones as Apple? they outsold apple by what.. 7 million Q1 2012? So yea. If apple is on a down turn (which is normal this far in their cycle) and Samsung is having a major upswing from the SGS3, the spread should be pretty wide between em. I dont know about "double", but its going to be a fat margin none the less. It will continue to be a fat margin until Apple ships the iPhone 5. It might even be a fat margin after the iPhone 5 ships, as Nokia and RIM continue to hemorrhage customers. Apple currently sells 2 or 3 phones while Samsung currently sells 30+ phones, so du-uh. But Apple is still doing pretty good though. so your whining becaue samsung has the capacity to produce 30 difrent phones to about 20+ diffrent variants'? its impressive to say the least they have this kind of manufacturing and selling capability. Gs3 alone this quarter is reported to be beating iphones in sales so what about that? Apple still manufactures and sells 3GS 8 & 16 gig GSM i4 ,16, 32gig CDMA i4 16, 32 gig GSM i4s 16, 32, 64 gig CDMA i4s 16, 32, 64 gig So, just by that count thats, 2 + 2 + 2 + 3 + 3 = 9 different devices. + you have their ipad line which is counted in sales ipad 1 16/32 gig WIFI ipad 1 16/32 gig GSM ipad 1 16/32 gig CDMA ipad 2 ipad 3 all with the same variants. So thats 9 + 6(pad 1) + 6 ( pad2) + 6( pad 3) so thats now.. 27 different units. and are they counting the ipod touch units as well still since they run iOS? thats at least another what.. 3 units? 6 if they still make the older version? So now your talking 30+ different devices manufactured by Apple in the last quarter. Sounds exactly the same as Samsungs 30+ devices. Your point is invalid. Face it. Apple simply got out classed. If you count different storage options and carrier branding (CDMA vs GSM), Samsung would have 200+ devices. The only number that matters is revenue + profit, in both categories Apple beats Samsung electronics (that is chips + TVs + computers + mobile combined). You can not compare number of units sold when the cheapest iPhone is easily 3-4 times as expensive as the cheapest Samsung phone. And cheapest items are the ones that sell most units. Cheapest items are the ones that sell the most units? Like the S3 right? Good logic. your point is invalid as the products you mention are sold everywhere the iphone is available.. Sprint for example does not sell any ipads.. or Verizon doesn't sell any 3Gs.. so your comparison is invalid.. Samsung on the other hand Samsung phones can be found in pawn shops..
Remix, you are confusing devices with variants. An Apple 4S with 32GB or 64GB is one device but 2 variants. Changing the flash memory doesn't make it a different device. A Toyota Camy has 4 bagger or 6 bagger, it's the same car but with different engines, thus different variant. Under remix's logic (a bit twisted) then a "white" iPhone is a different device from a "black" iPhone. There is only one i4s with 2 different memory sizes. Both phones are capable of GSM/CDMA. Apple can make 10000+ different phones if they like. But they chose not to! And that argument is not valid because no one will buy 2 different samsung smartphones. At Walmart -- Samsung smartphones are going for as low as $80. I think the model is the Boost Replenish. Samsung Galaxy Precedent on Straight Talk is like $130. Keep in mind Nokia was the global sales leader (of cell phones) at one time, meaning sales is not the best metric. In the business world, Return in Invested Capital is the best metric. At the three biggest carriers, the iPhone 3gs is going for as low as $0, with the iPhone 4 going for as low as $99. What's your point? Are you kidding me? 1. Even Canada has device subsidization. 2. 3GS is still offered somewhere else. Example: Canada and S.Korea. Thats a 2+ year device for free versus a 2012 device for free, not exactly the same thing. Mean while back on the playground little Timmy pushes little Kwon down and says my daddy makes more money than your daddy. So there! And then Kwon's dad beats up Timmy's dad. Little Timmy has TWO dads, so watch out Kwon' s dad. Samsung: Ohh stop it youuu.. This will just make Apple more jealous and more motivated to sue us. That's cool. Apple's lawsuits probably wont get them anywhere and all it's doing is making them look bad. I'm over it! I think most people are curious to see how many S3's are going to be sold in comparison to the newest model iPhone. 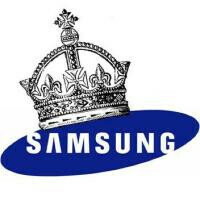 If Samsung can pass Apple phone for phone, well that'll be glorious. Great news!! Less people fall into Apple "scam". Still there are millions out there who stuck in 2010 technology. The fools and misinform. consider the prices of apple iphones as compared to samsung smartphones.definitely apple is in huge profit regarding production as compared to samsung. Samsung has sooo many phones Thats why it sells more than Apppppleee.....HOpe some worms will come and rot that apple..